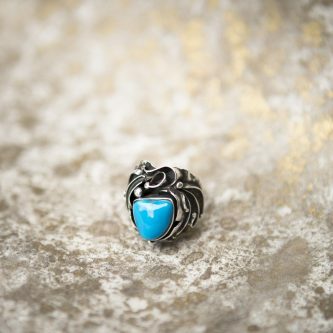 Also known as the “freedom of flight” stone, turquoise supports expansiveness and openness. Like an eagle flying very high, able to see far away, turquoise helps you perceive the bigger picture of any event. It cleanses all chakras and links you with Unity Consciousness. Building a bridge between the wearer and the psychic worlds, it opens your intuition and psychic abilities. Turquoise deflects anything that is of low consciousness and can heal misunderstandings. It teaches you to love your enemies, healing discord and allowing for a higher view on disagreements. It represents a feminine polarity. Physically, is can heal headaches, migraines, and female hormonal issues. It helps heal tissues and bleeding wounds. If worn every day, Turquoise can show a developing illness by changing color. To recharge this stone, place it in a bowl of Hematite stones. This will help it regain its color so it can be worn again to promote healing.